Back in 1910, the International Woman’s Conference put forward a suggestion to mark “International Woman’s Day” on 8 March annually. It was in the Soviet Russia of 1917 however, when 8 March was declared a national holiday, after women gained the right to vote in elections. The United Nations adopted the occasion in 1975. It’s been more than 100 years since we first talked about this, yet it is noteworthy that we need an occasion to celebrate the social, economic, cultural and political achievement of women. Needless to say, big things happen with small changes – so every step counts in the march towards equality, both in and out of the workplace. This year’s IWD theme is #PressForProgress, and it couldn’t come at a better time – where not just women, but all members of society need to be provided an inclusive voice, while employers must press for gender parity on all fronts. 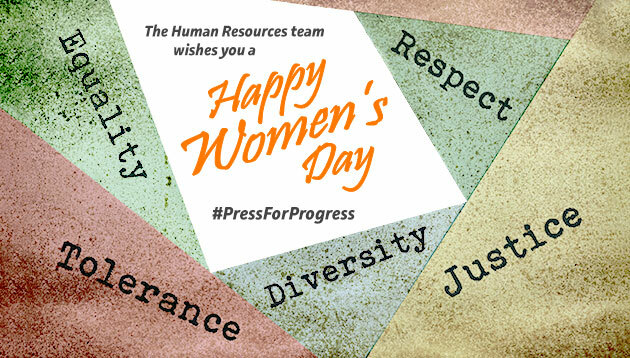 From the team at Human Resources, we wish you a Happy Women’s Day. We hope you have an engaged and diverse workforce this year! On this occasion, let’s affirm our commitment to building all aspects of diversity at the workplace, be it in gender, ethnic background, skills, age, or industry experience. On the occasion, Human Resources’ Jerene Ang has surveyed more than 20 HR and functional business leaders to find out their priorities on building gender parity in the workforce, and their advice for employers to provide conscious support to the cause. The first of this series of interviews will be released on 8 March 2018, and a weekly update thereafter – so please stay posted through our daily newsletter, HR Bulletin. You can also stay posted on our latest news, views and interviews by following Human Resources on Twitter, Facebook, and LinkedIn.